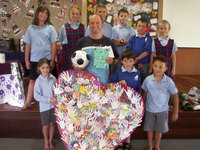 Farewelling a favourite – students at St Joseph’s School, New Plymouth, having played their final game of soccer with Fr Simon Storey, gather to wave goodbye as he sets off for a new appointment in Hawke’s Bay last term. The children delivered a moving assembly followed by a shared lunch. The day was finished off with a great game of soccer where we were joined by parents and some of our ex-pupils. Fr Simon would always come and play soccer with the students on a Friday.